Infrastructure is a backbone, a foundation on which businesses and economies can grow – at DB Thermal it’s our wheelhouse. Keeping up with the needs of a growing world and maintaining today’s existing and aging infrastructure can be seen as a daunting challenge. We see it as an inspiring one. With a problem solver’s instinct, we bring creativity and an entrepreneurial spirit to go beyond meeting our customers’ needs for safe, reliable and efficient solutions, to laying the groundwork for a more productive future. We’re focused on the individual requirements of our customers – be it new build projects, increased efficiency requirements for existing plants, modernization, construction or repairs. With over 45 years of experience, we can safely say we are a reliable partner to power utilities, refineries and operators of complex installations throughout Southern Africa. Founded in South Africa in 1970 and was previously part of the Deutsche Babcock Group, DB Thermal is currently part of SPX, with access to best in class design and engineering, global collaboration, technical skills and support whilst still ensuring high local content in manufacture and construction activities. Established customer relationships show full commitment over many years of operation. Environmental, health and safety performance to rely on with implementation of OHSAS 18001 and ISO 14001 envisaged to be completed in 2017. A ISO 9001 certified organization managed in accordance to principles and requirements of the ISO 9001 programme and our philosophy of building a culture of continuous improvement. Across all of our projects we place a strong emphasis on high local content and skills. Technologically advanced products to support infrastructure progress. Our focus on enterprise & supplier development as well as socio-economic improvement and preferential procurement has contributed to our achievement of a Level 7 Broad Based Black Economic Empowerment Certificate, providing 60% procurement recognition. 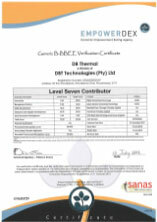 Our BBBEE achievements are audited by Empowerdex and our certificate was issued on 12th July 2018.